The Appraisal Institute of Canada was founded in 1938 and is the largest and most prestigous appraisal organization in Canada. 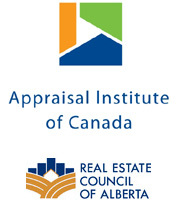 The Appraisal Institute of Canada (AIC) is a self-regulating professional association whose mandate is to serve the public interest and advance the standards and professionalism of real value experts. In order to serve the public interest, the AIC grants the use of the CRA (Canadian Residential Appraiser), AACI (Accredited Appraiser Canadian Institute), and P. App (Professional Appraiser) designations. AIC members are highly sought after for real property valuation or related advisory services. In addition to designations, the AIC represents professional real estate appraisers and valuation consultants nationally and is responsible for career awareness and promotion, research, education, and communication. Its members are highly regarded by the courts, real estate corporations, chartered banks, trust companies, mortgage lending institutions as well as all levels of government and private individuals.